An Airworthiness Directive (AD) is an important tool used by the Federal Aviation Administration (FAA) to communicate unsafe operating conditions relating to aircraft and aircraft equipment to aircraft owners. A primary safety function of the FAA is to require the correction of unsafe conditions found in an aircraft, aircraft engine, propeller, rotor, or appliance when such conditions exist or are likely to exist or develop in other products of the same design. These unsafe conditions can exist because of a design defect, maintenance, or other causes. Title 14 of the Code of Federal Regulations (14 CFR) Part 39, Airworthiness Directives, defines the authority and responsibility of the Administrator in requiring the necessary corrective action to address unsafe conditions. ADs are used to notify aircraft owners and other interested persons of unsafe conditions and to specify the conditions under which the product may continue to be operated. The standard AD process is to issue a Notice of Proposed Rulemaking (NPRM), followed by a Final Rule. After an unsafe condition is discovered, a proposed solution is published in the Federal Register as an NPRM, which solicits public comment on the proposed action. After the comment period closes, the final rule is prepared, taking into account all substantive comments received, with the rule perhaps being changed as warranted by the comments. The preamble to the Final Rule AD provides response to the substantive comments or states there were no comments received. In certain cases, the critical nature of an unsafe condition may warrant the immediate adoption of a rule without prior notice and solicitation of comments. The intent of an Emergency AD is to rapidly correct an urgent safety of flight situation. This is an exception to the standard process. If time by which the terminating action must be accomplished is too short to allow for public comment (that is, less than 60 days), then a finding of impracticability is justified for the terminating action, and it can be issued as an immediately adopted rule. The immediately adopted rule will be published in the Federal Register with a request for comments. The Final Rule AD may be changed later if substantive comments are received. An AD is no longer in effect when it is superseded by a new AD. The superseding AD identifies the AD that is no longer in effect. There are no compliance requirements for a superseded AD. Those of a less urgent nature requiring compliance within a relatively longer period of time. ADs are the “final rule” and compliance is required unless specific exemption is granted. Aircraft owners are responsible for ensuring compliance with all pertinent ADs. This includes those ADs that require recurrent or continuing action. For example, an AD may require a repetitive inspection each 50 hours of operation, meaning the particular inspection must be accomplished and recorded every 50 hours of time in service. CAUTION: Aircraft owners are reminded that there is no provision to overfly the maximum hour requirement of an AD unless it is specifically written into the AD. For help in determining if an AD applies to your amateur-built aircraft, contact your local Flight Standards District Office (FSDO). Certificate number of the repair station or mechanical performing the work. For ready reference, many aircraft owners keep a chronological listing of the pertinent ADs in the back of their aircraft and engine records. Generally, a summary of ADs contains all the valid ADs previously published. Figure 9-1 is a sample form of summary of ADs. Figure 9-1. 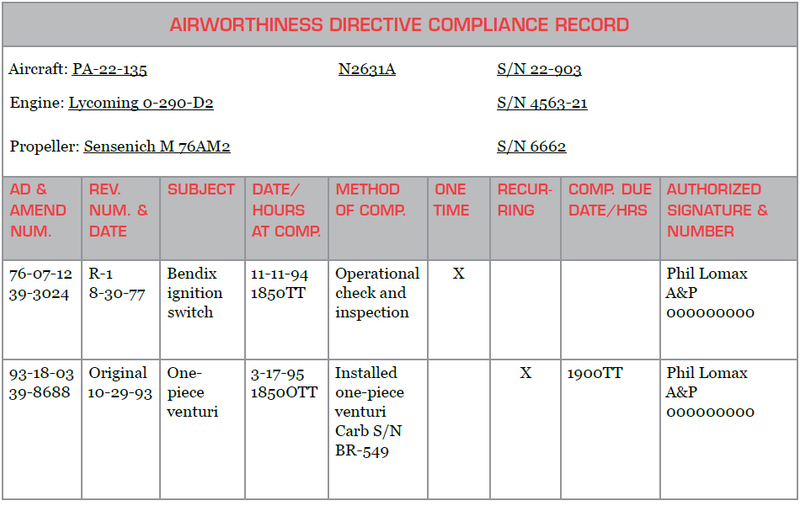 Sample Airworthiness Directives Compliance Record. This sample AD Compliance Record is intended to show you an acceptable format for recording the required information to evidence your aircraft’s compliance with applicable ADs. The FAA does not prescribe a specific format; however, the information discussed in this chapter must be maintained with the aircraft’s maintenance records. Both AD categories (small and large aircraft) are published in biweekly supplements. All ADs are available on the FAA website at www.faa.gov. Advisory Circular (AC) 39-7 (as revised), Airworthiness Directives, provides additional guidance and information for aircraft owners and operators about their responsibilities for complying and recording ADs. For more information, contact the FAA Regulatory Support Division, Delegation and Airworthiness Programs Branch (AIR-140).